I have been having an urge to make pickles. Not the kind of pickles that you put up in big jars using a canner – I used to make those pickles when I was doing more earth mother sorts of things. I even still have the canner and tools. I have been thinking about quick pickles, the kind you mix up an hour and after sitting in their brine for an hour or overnight, they’re ready to go. I found several recipes for quick pickles in a recent Sunset magazine. I made these to take to an office barbecue – a change from the usual potato salad and cole slaw. The cucumber pickles were gone by the tie the barbecue was over – none left to take home. I had carrot pickles left, and they kept surprisingly well for a week or so. When a friend came to dinner and I brought them out to snack on, they still had a lot of crunch. Peel carrots and cut into 1/4-in. matchsticks. Bring 3 cups water and all ingredients except carrots to a boil in a large saucepan. Reduce heat to low and simmer 1 minute. Add carrots and simmer until almost tender, 2 to 3 minutes. Transfer carrots and liquid to a bowl and let cool to room temperature. Chill, covered, overnight to let flavors develop. Serve cold. Keeps, chilled, up to 1 week. Makes 6 cups with 0 grams of fat. 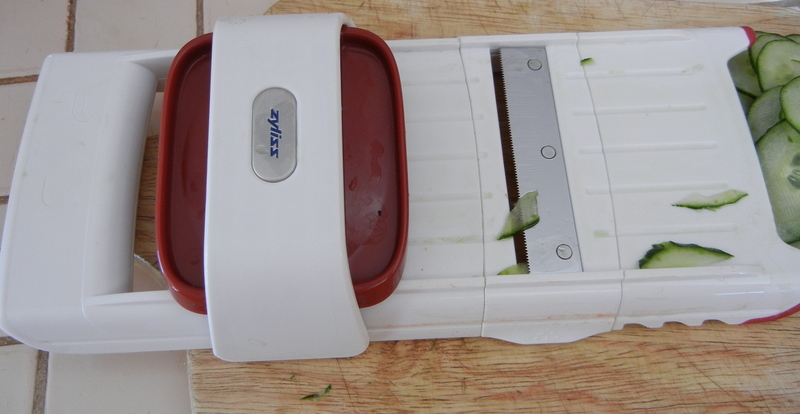 Slice cucumbers and onion very thinly on a mandoline or with a knife. Put both in a medium bowl. Peel tough outer layers from lemongrass and smash core with a meat mallet or back of a small heavy saucepan until flattened. Mince core and add to bowl (or use the paste that comes in a tube). Whisk sugar, salt, coriander, pepper, and vinegar together. Pour over cucumber mixture and chill at least 1 hour, stirring gently a couple of times. Serve cold. Keeps, chilled, up to 1 day. Makes 3 ¼ cups at 0 grams of fat. 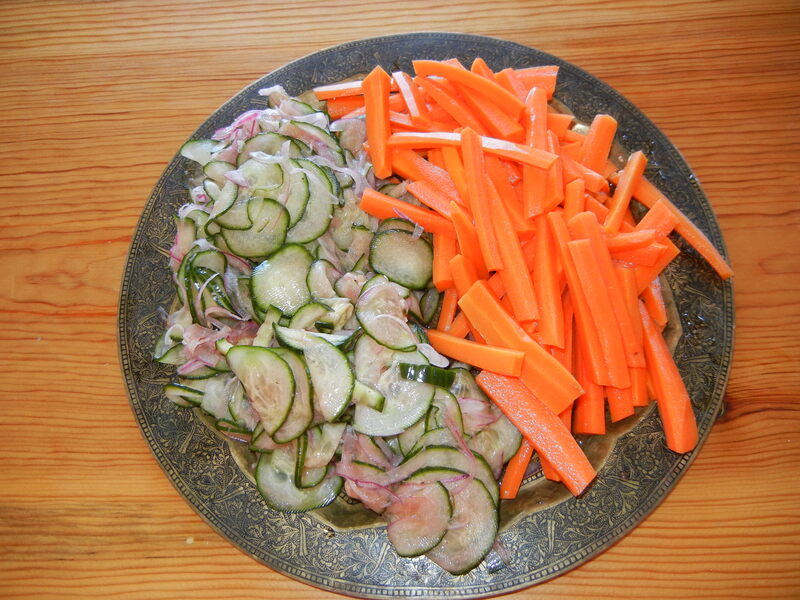 This is a quick salad with a Korean flair. It first appeared in Cooking Light and is a nice buffet dish. It also makes a good lunch take-along with a bit of kick. Combine first 7 ingredients (soy sauce through red pepper) in a large bowl, stirring well with a whisk. Add cucumber and carrot and toss well. Sprinkle with sesame seeds. Makes 8 servings at 2.7 grams of fat/serving. 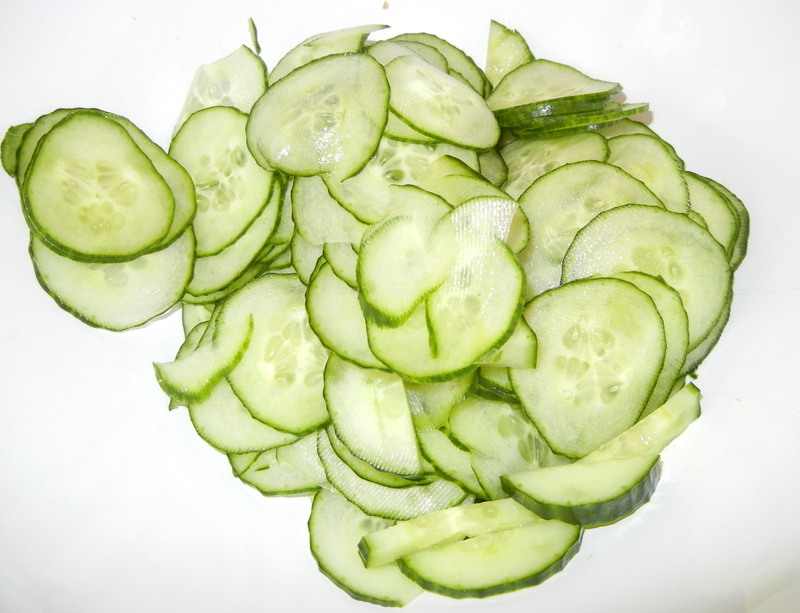 HINT: To seed cucumbers, cut cucumber lengthwise into quarters. Use a knife or spoon to scoop out the seeds. Here is a cold salad that will warm up your winter. It’s a good buffet dish because you can make it ahead and add the peanuts and cilantro later. Or even make it without the peanuts to avoid allergies. This salad has that nice combination of tangy sour, sweet, and hot. The original recipe came from Cooking Light, and I served the salad at a buffet lunch in my office, where it had no leftovers to take home. Toast peanuts over medium heat in a small skillet, 4-6 minutes, until they are fragrant and just start to brown. Stir frequently to prevent burning. Remove from heat and set aside. In a medium bowl, whisk together vinegar, soy sauce, sugar, red pepper, ginger, and black pepper. 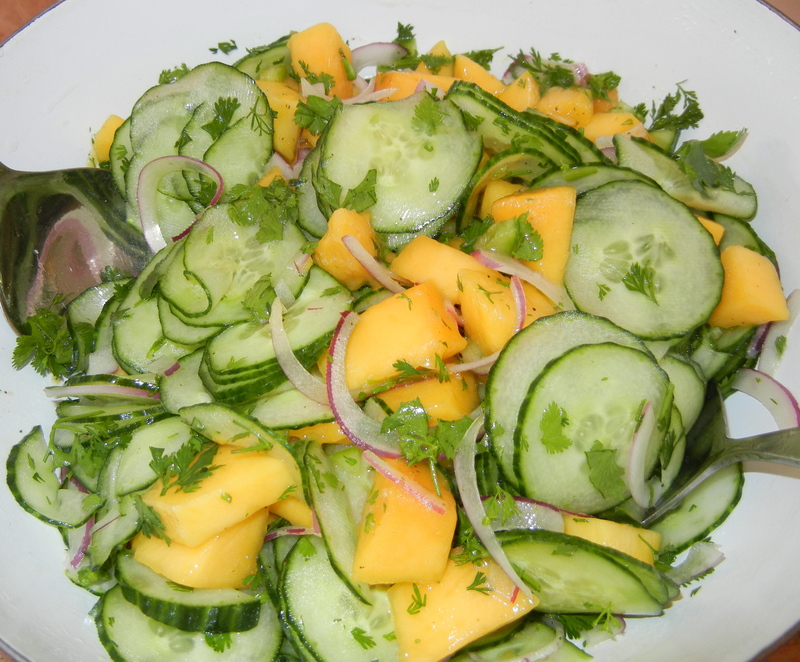 Halve cucumbers lengthwise, remove seeds, and slice thinly cross wise. Add cucumbers and onion to dressing and toss gently. Cover and refrigerate 1-2 hours. Sprinkle peanuts and cilantro on salad just before serving. Makes 6 servings with 2 grams of fat/serving.